If you’re a programmer or hiring manager in tech, you’ve probably heard a range of opinions on coding bootcamps. This new education model came on the scene about four years ago, promising to transform students into job-ready developers at a fraction of the time and cost of a degree. The initial results were impressive- students from many different backgrounds began tech careers, helping to bridge the skills gap. Flash forward to 2016, and students and employers alike are wondering if bootcamps will continue to have an impact. Now that more people are interested in tech, will bootcamps become a bigger player in higher ed? 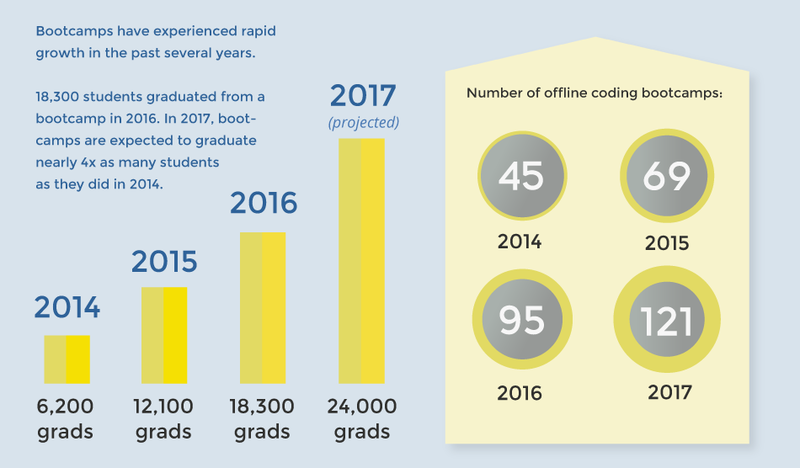 Over the past year, SwitchUp has surveyed over 1,000 coding bootcamp grads from 76 code schools. The majority of grads are profiting from a bootcamp education, and grads are actually seeing a bigger salary bump over last year. Respondents in 2015 reported an average increase of $18,101 within six months. This year, respondents saw an average increase of $22,700 after six months. 80% of grads reported being satisfied with their bootcamp education in 2016. This is down slightly from 2015, when satisfaction was at 86%. Also, both class sizes and tuition are going up. The average size of a bootcamp class was 30 students in 2016 (up from 27 students in 2015), and tuition now averages about $12,800. Though it should be noted that the length of a bootcamp has also increased- from 9.6 weeks in 2015 to 10.8 weeks in 2016. 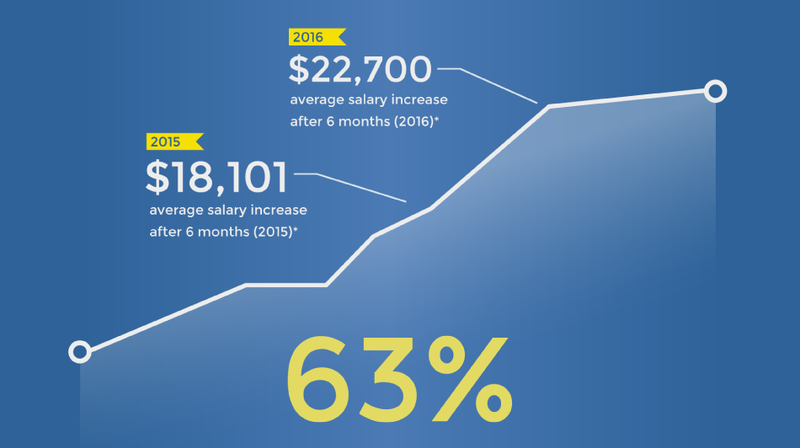 In 2016, 68% of bootcamp grads were working in the IT industry within six months. This is up from 61% in 2015. Coding Bootcamps have been praised for adding diversity to tech, and this is definitely true when it comes to female programmers. In 2016, our data found that 43% of coding bootcamp grads were women, up from 41% in 2015. Conversely, just 12% of computer science grads are women. Bootcamps have successfully paved the way for people from every background to get started in tech. It remains to be seen if computer science programs will become more diverse in the future. Bootcamps continue to attract career-changers from a range of backgrounds. The average student has some professional experience under his/her belt, and is going into programming to take advantaged of higher salaries and better job prospects. 6. Since 2014, the total bootcamp market has tripled in size. To paraphrase Marc Andreessen- Bootcamps are eating the world! The number of bootcamp grads jumped from 6,200 to 18,300 between 2014 and 2016. This number is expected to jump to 24,000 grads in 2017. The bootcamp market is also expected to grow to $344 Million next year. The statistics are clear that bootcamps aren’t going anywhere soon. The model is working overall, and more students are starting to consider a short-term program as a viable path to a new career. As bootcamps move out of the “proof of concept” stage, students and employers are going to demand greater transparency and quality. This may make it difficult for bootcamps to compete for students, but it will also mean the top bootcamps will stand out. We’ll see the best bootcamps become more competitive, and they’ll be able to offer an education that rivals top universities. Recent reports indicate that job opportunities in software engineering will also continue to climb. However, we expect that more bootcamps will look to fill in-demand jobs in fields other than coding, such as UX Design and Data Science. Overall, we’re expecting more bootcamps to launch in 2017, and for many programs to provide higher value for students. To view our complete data, head on over to SwitchUp’s market research. If you’re considering a bootcamp education, take a look at SwitchUp’s top-rated bootcamps of 2016.